Nine diverse stories show this Peruvian-American newcomer’s passionate involvement with his material. Whether it’s a deadly landslide, a no-holds-barred neighborhood turf war, or a guerrilla war convulsing a nation, Alarcón jumps right in with a fearlessness that becomes his most striking quality. Six of these stories are set in Peru, three in New York City. In “The Visitor,” a man huddles with his three children, the only survivors of an Andean mountain landslide that has buried their town and their mother. It’s short, but it cuts to the bone. A poor Lima neighborhood erupts in “Flood,” but the fierce joy of a street fight pales into insignificance when the state decides to end a prison riot by burning down the institution, roasting the inmates alive. For his two longest stories, Alarcón replaces linear narrative with a mosaic from different time periods. The title piece runs from 1966 to 1989, when Fernando is killed by a bomb in the jungle. For years, he had been torn between the “bourgeois fantasies” of raising a family and the inescapable duty of fighting with the guerrillas. Alarcón limns his ambivalence with grace and power. There is no ambivalence, however, in “City of Clowns,” which first appeared in the New Yorker’s 2003 Debut Fiction issue; there’s only the dull anger of reporter Oscar, whose father Don Hugo has just died. Oscar can’t forgive his father for having left the household to start a new family with his black mistress, Carmela, or his sweetly humble mother for making a separate peace with Carmela. There’s much more to this multilayered story, where everyone in “beautiful disgraced Lima” has their own hustle. Best of the New York stories is “A Strong Dead Man,” about a Dominican teenager who struggles with his father’s death from a stroke. “Third Avenue Suicide” is a carefully observed domestic drama, but it’s left unresolved. 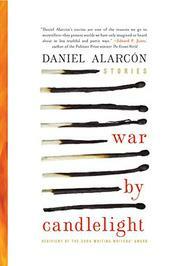 The extremes of death and war and poverty are what impel Alarcón to his best work. A rare combination of technical accomplishment and generous heart.